The original Husqvarna K760 concrete saw was engineered for construction professionals who require the very best power cutter to handle all of their cutting needs on the job site. The Husqvarna K760 isn’t a tool for the casual backyard handyman — it’s a powerful, lightweight and ergonomic all-purpose power cutter. The K760 is the perfect tool for any construction or renovation project. This isn’t your grandfathers concrete saw. Times have changed. The Husqvarna K760 is a heavy-duty cutting machine capable of handling a wide variety of applications such as: Cast concrete, blocks, curbstones, garden pavers, floors, walls, deep cutting, burying cables, pipes, cutting adjustments to doors and windows, asphalt and rescue cutting. The Husqvarna K760 is one of the best well-rounded concrete saw you can buy. If you’re not aware, Husqvarna has released the Husqvarna K760 ii, which is a better buy than the original. SmartCarb, has an innovative built-in automatic filter compensation which maintains top power and reduces fuel consumption. Patented, dust sealed starter unit. Return spring and pulley bearing are fully sealed. DuraStarter, includes a starter cord with better durability. Some models have a Poly-V belt, for better transmission of power, longer product life and extended service intervals. Find out everything you need to know before deciding if the Husqvarna K760 is the right tool for you. Capable of tackling a wide variety of projects. 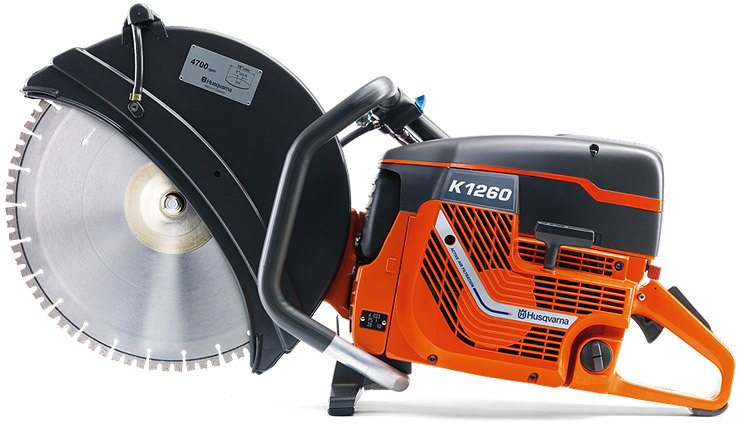 In this article we’ll also look at the Husqvarna K970 Concrete Chainsaw as well as the K3000 Cut-and-Break electric saw, the Husqvarna K760 deep cutting saw, the K970 Power Cutter and finally the K1260 powerhouse cutting saw. I think it’s always a good idea to see what your options are when you’re trying to decide upon the right tool for your projects. If you’re reading this then my guess is you’re a professional and you already know what you need. My job is to provide you with all the information you need to help you make the right decision. These are expensive tools but if you’re working on large projects then you want the best equipment available, not just for safety reasons but also for reliability. It’s no secret that Husqvarna makes some of the best tools available on the market. An impressive piece of machinery. If you don’t already know, Husqvarna is the biggest manufacturer of outdoor power products and they’ve been around since 1689. Back then they obviously weren’t making power tools but they did start off making rifles, which is also the inspiration for their logo. Either way, if you’re ever in doubt about what brand to buy just stick with Husqvarna and I can assure you — it will be money well spent. Who are these heavy-duty Husqvarna Power Cutters designed for? Since these are expensive tools you probably want to know what type of warranty they come with. Well, it varies depending on the model. The Husqvarna K760 comes with a one year Gold Medal Equipment Warranty. Visit the Husqvarna warranty page for all the manufacturer details. If you buy any of these Husqvarna power cutters frrm Amazon you can email warrantyquestions@amazon.com and they will answer all of your warranty related questions. A fantastic resource for professionals or beginners. Husqvarna has created an iPad app that covers everything you want to know about using a power cutter, including: preparation, safety, technique, maintenance, troubleshooting, and everything in-between. It’s filled with advice, tips and general information specifically designed to help you get the most out of your Husqvarna K760 power cutting saw, but the information applies to all Husqvarna power cutters. If you don’t have an iPad, don’t worry. Thankfully Husqvarna has also created a downloadable PDF file for you. View or download: Husqvarna Power Cutter User Guide. This extensive digital guide is intended to be a complement to the Owners Manual. It’s an exceptional informational resource for professionals as well as beginner users. Basically, you’d be foolish not to either download the iPad app or the PDF document. It’s an excellent resource and reference — and it will also help you decide if this is the right tool for you. The user guide is comprised of photos, video and advice to show you the most critical things to consider before, during and after cutting. The K760 is featured in the guide in order to demonstrate how to operate Husqvarna power cutters correctly, safely and effectively. The goal for this guide is to teach you how the tool works while inspiring you in your work. It’s an excellent guide so I highly recommend you take the time to read it thoroughly, whether you’re experienced or just starting out. Download the K760 Power Cutter User Guide from iTunes. When using a concrete saw it’s absolutely essential that you wear the proper safety gear. At Chainsaw Journal we’ve already written thorough articles on chainsaw safety and many of the guidelines also apply to using these power cutters. And lastly, wear a respirator to keep out the dust particles. And if you’re going to be immersed in dangerous particles thenconsider getting a more advanced respirator such as the MSA Safety Works 817663. You’ll notice that I’ve included a lot of videos and images in this article, far more than I typically use because in all honesty, videos and pictures communicate far more than words ever can. Each concrete saw in this article has a full feature list as well as their corresponding manual, parts list and brochure. I spent a lot of time gathering all the most important information so that you can make the best buying decision. The K760 in all its glory. CLICK IMAGE for larger view. Developed with ergonomics in mind. The Husqvarna K760 has an excellent power-to-weight ratio and exceptionally low vibrations (below 2.5m/s2) which ultimately means you can comfortably work for longer hours without having to be concerned about vibrational monitoring. You should be particularly adamant about only buying a power cutter that has low vibration. The dangers of vibration are very real and can be debilitating if you consistently use poor quality tools. The condition is called Hand-arm Vibration Syndrome (HAVS) and can be entirely avoided by spending your money on ergonomic tools that are designed to protect you, like the Husqvarna K760. Let the machine do the work. Do not force or ‘press’ the blade. Slowly move the blade forward and backward to achieve a small contact area between the blade and the cutting material. This effectively reduces the blade temperature and allows for effective cutting. Husqvarna K760 on the job. If you need a well-balanced concrete saw that will consistently perform to the highest standards then you have to seriously consider the Husqvarna K760 to be at the top of your list. Perfect for a wide variety of masonry work. This is a professional saw in every way. View or download the MANUAL for the Husqvarna K760 Concrete Saw. View or download the PARTS List for the Husqvarna K760. View or download the BROCHURE Husqvarna K760. Exceptionally low Vibrations: Below 2.5 m/s2 in the cutter handles. Long service intervals: Poly-V belt + maintenance-free DuraStarter + Active Air Filtration. Advanced engine performance: Steamlined cylinder design, digital ignition system & X-Torq engine technology. Quick Start: Unique carburetor design, digital ignition system, air purge and decompression valve. Maintenance-free air filter: Only check or change if power drops. Easy to change blade guard position: Light magnesium blade guard assists in cutting with its stepless adjustment. High power output with lower fuel consumption: Automatic filter compensation SmartCarb. Less slurry and low water consumption: Excellent dust control with the wet cutting kit. Designed with a progressive water valve for exact adjustment of the water volume to efficiently bind the dust and reduce slurry. X-Torq engine. Less emissions and increased fuel efficiency. Blade Retarder: Reduces the stop time of the blade when the K760 is switched off allowing you to move quicker to the next job. Maintenance-free starter: Dust sealed starter unit with a sealed return spring and pulley bearing. DuraStarter also includes a starter cord with greatly increased durability. This makes the starter virtually maintenance free, further enhancing the reliability of our cutters. Reduced wear due to the fully sealed transmission and drive belt, which keeps dust out. Cuts close to walls or ground: Reversible cutting arm. Anti-vibration system: Operator always stands close to the saw due to the handle configuration and short engine body. Poly V-belt: Efficient transmission of power requires fewer adjustments & lasts longer. SmartCarb: Built-in automatic filter compensation maintains high power throughout its life. Detailed images of the Husqvarna K760. The Husqvarna K3000 Cut-n-Break is perfect for indoor use and smaller jobs where over-cutting at the corners might be a concern. It weigh 18 lbs making it relatively lightweight and easy to use for long periods of time. Water cooling must always be used with the K3000 Cut-n-Break. Not only does it keep the blade cool but it also prevents dust from building up. Applications: Adjustment to openings, blocks, curbstones, garden pavers, cast concrete, deep cutting, floors, walls, grooves, pipe trenches, pipes. View or download the MANUAL for the Husqvarna K3000 Cut-n-Break saw. View or download the PARTS List for the Husqvarna K3000. View or download the BROCHURE Husqvarna K3000. Can cut up to 16″ deep in stages. This saw belongs on a construction site. Cost-efficient cutting: Innovative cut-n-break method. Work through the material in steps. Low tool cost. Excellent cutting depth: Capable of making cuts up to 16″ deep. Ideal for flush cutting: Adjustable blade guard allows close cutting to walls and floors. Designed with twin blades. Highly stable core. Wet cutting kit: Effective dust management via the water adjustment. Forward rotating blade: Minimizes the risk of sticking and kickbacks. Electronic Softstart: Provides starting with normal, slow acting fuses. Elgard: Electronic overload protection changes the rotation speed to warn of approaching overload. The K760 uses twin blades to do the dirty work. Applications: Adjustment to openings, burying of cables, cast concrete, deep cutting, grooves, pipes. The ideal tool when you need to cut deep without over-cutting at the corners. The Husqvarna K760 Cut-n-Break allows you to cut as deep as 16″ from one side. The two high-speed blades make a core in the saw cut, which you can easily break off using the included breaking tool. With this method, you progressively work through the material, at a very low diamond tool and maintenance cost. This tool comes with twin blades and a breaking tool. To make K760 Cut-n-Break more comfortable Husqvarna made sure that the the distance between the handles was far apart. The handles and the short engine body mean the user always stands close to the machine, for easier handling and control. An intimidating machine. Made for professionals. The Husqvarna K760 machine′s has an excellent vibration damping system that greatly reduces the transfer of vibration between the engine/cutting equipment and the handles. The engine body, including the cutting gear, is insulated from the handles by Husqvarna’s patented vibration damping units. Symptoms include numbness, loss of feeling, tingling, pricking, pain, loss of strength, changes in skin color or condition. These symptoms normally appear in the fingers, hands or wrists. These symptoms may be increased in cold temperatures. Prevention is the key. Pace yourself when you work. Notice if there are any physical changes and make sure you stop if you feel any unusual symptoms. Also, I highly recommend you wear anti-vibration gloves for extra protection. View or download the MANUAL for the Husqvarna K760 Cut-n-Break saw. Active Air Filtration: Two-step filtration mechanism has centrifugal cleaning and a single paper filter. Anti-vibration system: Reduced vibration in the cutter handles. Increased comfort and longer working sessions. SmartCarb: Built-in automatic filter compensation. Maintenance-free starter: Dust sealed starter with sealed return spring and pulley bearing. Active Air Filtration: Our two-step filtration system with centrifugal cleaning and a single paper filter increases product life and extends service intervals. EasyStart: ensures easier starting by reducing the compression in the cylinder. Built to last and packed with features for heavy-duty construction. Replacement Twin Blades (EL 10 CnB). You’ll need them. For wet cutting only. Two blades. 16 inch cutting depth. Designed to cut in stages through walls as thick as 400 mm (16″). The self-sharpening segments are designed to give a free-cutting tool regardless of direction of blade rotation. Integrated pulley in the blade design. Applications: Adjustment to openings, asphalt, blocks, curbstones, pavers, burying cables, floors walls, pipes. Versatile, reliable, lightweight and powerful — the Husqvarna K970 concrete saw is the ultimate choice when you need an all-around cutter performing in the difficult situations. Able to withstand climate and fuel variations and suitable for flatwork when used with the Husqvarna KV970 cutting cart, which allows you to concentrate on the cutting job and not be distracted. Use a good quality unleaded gasoline. The minimum octane grade recommended is 87. If you run your concrete saw on a lower octane grade knocking will likely occur; which forces your engine to run at a higher operating temperature and an increased bearing load. This can result in serious engine damage. When working at continuous high revs you need to use a higher octane rating to ensure safe and efficient operation. View or download the MANUAL for the Husqvarna K970 saw. View or download the PARTS List for the Husqvarna K970 saw. Limited sensitivity to outdoor conditions and fuel variation thanks to the innovative cylinder design and a muffler with an integrated heat deflector. Easy to start: Cohesive digital ignition system integrated with an air purge & decompression valve. Long service intervals: Poly-V belt combined + maintenance-free starter + Active Air Filtration. Reduced slurry and minimal water consumption: The wet cutting kit provides fantastic dust control. Made with a progressive water valve for precise adjustment of your water volume, effectively binding dust and dramatically limiting slurry. Adjustable blade guard position: Stepless Magnesium blade guard. Fits multiple blade bushings: 20mm and 25.4mm bore. Less wear and tear due to the fully sealed transmission. Protected against cutting dust. X-Torq engine: Less emissions & higher fuel efficiency equals increased power. Reversible cutting arm lets you cut closer to walls or the ground. Active Air Filtration: Two-step filtration system. Centrifugal cleaning. Single paper filter. Increased product lift. EasyStart: Works by reducing the compression in the cylinder. Applications: Adjustment to openings, cast concrete, blocks, curbstones, pavers, deep cutting, grooves, pipes. If you’re specifically looking for a concrete chainsaw then you should read our article entitled: Buying a Concrete Chainsaw, where we go into detail with the Husqvarna K970, as well as other concrete chainsaws. The gas power cutter Husqvarna K970 concrete chainsaw is able to cut up to 390 mm (15.3 inches) from one side. It can also make openings as small as 11 x 11 cm (4.3 inches), which makes it perfect for oddly shaped openings. 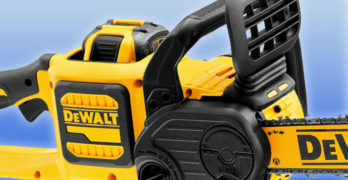 Well-suited for cutting minor adjustments to window and door openings, when you want to avoid over-cutting the corners. Side view of the K970 concrete chainsaw. View or download the MANUAL for the Husqvarna K970 chainsaw. View or download the PARTS List for the Husqvarna K970 chainsaw. View or download the BROCHURE for the Husqvarna K970 chainsaw. Well, most of these power cutters have the same features so I’m just going to give you the high-level points for the Husqvarna K970. 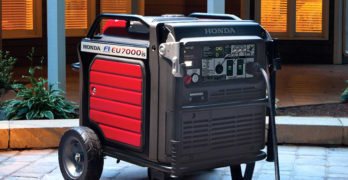 The truth about the K970 and all the other power cutters in this article is the fact that these tools have been designed with you in mind — first and foremost. The overall design and components are well integrated and developed to be a part of a system. Every component is engineered to work efficiently together and they’re optimized to give you the most power while keeping you safe and comfortable. That’s why I love Husqvarna. They understand the needs of the user and they invest a lot of time and money into developing tools that are easy to use and durable. The K970 is unique as it allows you to make detailed plunge cuts. Ideal for cutting minor adjustments to window and door openings. Cutting pipe. The K1260 is a beast. Applications: Blocks, curbstones and pavers, cast concrete, floors, walls, grooves, pipes, cutting smaller holes outdoors and adjusting window and door openings, asphalt and metal cutting. The Husqvarna K1260 is the granddaddy of concrete saws. Sometimes you just need a lot of power and the K1260 delivers with 7.8 hp. If you’re on a tough project with difficult materials to cut then this is probably the tool you want. Suitable for flat work when used with the corresponding KV 970 cutting cart which enables you to fully concentrate on the cutting job. The K1260 is designed for the heavy-duty cutting of concrete and stone in alterations, renovations and new construction. 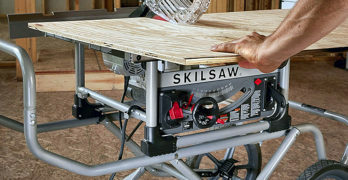 Learn more about the KV 970 cutting cart from Husqvarna. Reduced wear: Transmission is completely sealed. No dust gets in. SmartCarb: Automatic filter compensation. Improved power and greater fuel efficiency. Cutting concrete pipe with the K1260. What oil do I use in my saw? Husqvarna XP Professional Performance 2-stroke engine oil. For highly demanding applications. A synthetic blend designed for challenging professional applications. Husqvarna Low Smoke 2-stroke engine oil: High performance oil for the demanding prosumer as well as consumer use. Semi-synthetic blend with noticeably less exhaust smoke. Husqvarna OilGuard Premium 2-stroke oil: Specially formulated for Husqvarna OilGuard 2-stroke engines. A synthetic blend designed for tough professional usage. The only oil that will properly run in the Husqvarna OilGuard equipped engines.